I’m honored to help sponsor some really great dance events coming up soon. These events inspired me to design some new images which I’m in the process of adding to my shop. October 13th is The Florida Pole & Aerial Arts Showcase in Orlando, FL. This vaudeville themed show helps promote the skills, strength, and creativity it takes to do Pole Fitness, Aerial Arts, & Dance. Aerial Arts include the Aerial Hoop and Aerial Silks. Aerial Hoop, also known as lyra, is a large hoop dangling in the air which the aerialist does amazing tricks and spins on. Silks uses strips of fabric strung from the ceiling in which the performer twists and turns into jaw dropping stunts. It’s Cirque de Soleil type of performances! This showcase will be full of talent and beauty in all forms, including pole dance, burlesque, hula hoop, contortion, and more. It’s organized by Allison Sipes, one of the top Professional Pole Athletes in the country & founder of www.OnlinePoleLessons.com (excellent site if you want to learn Pole spins and tricks). 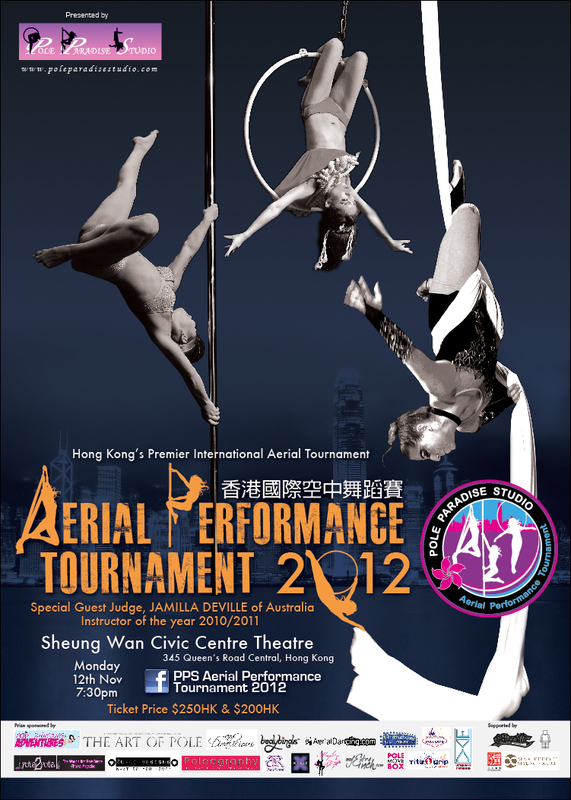 November 12th is the Aerial Performance Tournament 2012 in Hong Kong. This tournament, created by Symone Dolai, is the only aerial tournament in the world that combines all 3 aerial disciplines: Pole Dance, Aerial Hoop and Aerial Silks. Symone owns and teaches at Pole Paradise Studio in Hong Kong. She’s performed all over the world and has won several awards. This is the third year her studio has hosted this event. In the next few weeks I’ll finish adding all of the new Aerial Silk designs in my store & start focusing on getting some gift sets together. This entry was posted in Dance and tagged aerial arts, aerial hoop, aerial lyra, aerial performance tournament 2012, aerial silk, pole dance, the florida pole & aerial arts showcase on October 3, 2012 by Billie Gardner.